Nazzareno Vicari (right) cradles a bunch of grapes in his hand, his weathered face creased into a squint as he looks upwards into the bright sunshine of the Marche. He’s trying to find the right words to explain the difference between the soil on which he’s planted the purple-skinned grapes he’s showing me and the white grapes growing just over the brow of the next range of hills. queries about soil types and micro-climates, questions that his Tuscan neighbours can answer in their sleep thanks to all the practice they get. But Vicari does know how to extract the best possible grapes from his 40-year-old vines, whose gnarled trunks plunge deep into the heavy chocolate-brown soil. It’s clear that the Marche’s grape growers benefit from a variety of terroirs. You can tell by looking at the sweeping chiaroscuro shades of the rolling hillsides, which hint at a broad brushstroke of chalk-rich soil here, a streak of sand there and a thin furrow of clay in between. And it’s obvious to even the most casual of observers that some vineyards are planted on slopes facing due south, others hug the contours that benefit most from the rising sun, still others are planted on the relatively flat land between the hills. This patchwork lends complexity to the region’s wines, which include the relatively well known but under-appreciated Verdicchio dei Castelli di Jesi; the rich, velvety smoothness of Rosso Conero (named after the mountain that dominates the Adriatic coastline) and the wonderfully named Lacrima di Morro d’Alba. It’s a bunch of Lacrima grapes that Vicari is showing me with such paternal pride; thin-skinned grapes whose purple skins are dusted with a whiteish bloom, the long bunches loose and open – a benefit as it means the grapes are less liable to become rotten after a thunderstorm like the one that swept the vineyards two days ago. Over the past few days I’ve come to love Lacrima, whose name means ‘the tears of Morro d’Alba’, a local village. I was hoping for a romantic story behind the name, but the pragmatic reality is that the grapes’ thin skins split easily, allowing ‘tears’ of juice to escape. I love Lacrima for its strangeness: while there are many white wines that are described as aromatic, this is not a word I’ve ever heard used for reds. Nevertheless, Lacrima very definitely makes aromatic wines. They’re perfumed with vivid aromas of violets and roses, sour cherries and, occasionally, a hint of spiced tea – just the kind of wine that I enjoy with spicy Asian food, which tends to make most reds appear clumsy and dry. I’ve come to enjoy Verdicchio as well. Most of the time it’s dismissed as being yet another neutral white grape variety from Italy, but the best of them repay ageing, developing layers of nutty, honeyed flavours as they do. As for Rosso Conero, I’m amazed we don’t see more of these wines over here – they’re just the kind of wines most people seem to enjoy: ripe, full-bodied reds with deep plummy fruit and just enough acidity and tannins to make them good partners for food without being so structured that they alienate casual drinkers. So why have you never tasted a Lacrima di Morro d’Alba? Why is that wine buffs don’t hoard top-level Verdicchio in their cellars? And why aren’t supermarket buyers flocking to the Marche’s hills in order to snap up stocks of Rosso Conero? Or, for that matter, why do we seldom get excited about some of the Marche’s other idiosyncratic wines? Sadly, as Vicari told me with a resigned shrug, he finds it difficult to sell his wine in the UK. It’s the same old story wherever I go: the wines made by small- and medium-sized producers in these less-celebrated pockets of the world don’t get shelf space because they don’t confirm to the conservative palates of those who like to buy predictable branded wines from the supermarkets. Furthermore, they’re not produced in high enough volumes to satisfy the demand of high street retailers, who won’t look at them anyway because their producers can’t afford to pay for promotions. These wines don’t tend to attract the attention, either, of consumers who buy from independent merchants because they don’t get the critical praise and column inches enjoyed by wines from more fashionable production zones around the world. The danger is, of course, that if quirky wines like Lacrima or undervalued wines like Verdicchio continue to fail to sell, their producers will become tempted to rip up their old vines and plant commercially successful international grape varieties in their stead. If they do so, the wine world will take another step towards greater conformity. So next time you reach along the supermarket shelf for that bottle of heavily discounted New World Shiraz or are tempted by a prestigious bottle of Brunello when browsing the catalogue of a niche retailer, stop and think. 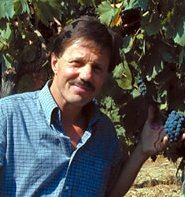 Think of a short, wiry man with a neat moustache and weathered skin proffering a bunch of sun-warmed grapes and hoping that this vintage will be the one to bring his wines to a wider audience. Think about him, then – at least once in a while – resolve to try something new. Only by doing so can you help to ensure that diversity and passion will survive in a world of bland generic brands and Parker-pointed monsters. And only by doing so will you ever get to taste some of the world’s most interesting wines. One of the Marche’s biggest producers, the Pecorino d’Abruzzo 2007 is made from an early ripening grape and is worth trying for its stony minerality and crisp green apple fruit. Not a complex wine, but good as an inexpensive quaffer. The same producer’s Cumaro Conero Rosso Riserva DOCG 2005 offers plenty of ripe mulberry, cherry and bramble fruit tinged with chocolate and spice. The tannins are fine grained and the acidity is surprisingly crisp. See all UK stockists of Umani Ronchi on wine-searcher.com. This is one of the star estates of the area – you can tell by the vertiginous prices. I’d recommend eschewing the rather forced international style of the producer’s Chaos IGT 2004 and opt for the Visions of J Conero Rosso 2004, named after a Dylan song, the most elegant version of this wine I tasted during my trip, with plenty of pure, mineral-laden fruit. If you can’t stomach the steep price, the basic Rosso Conero 2006 is pleasantly sappy and floral, with plenty of lively acidity and crunchy tannins. See all UK stockists of Fattoria le Terrazze on wine-searcher.com. Producers of some cracking white wines, the ‘basic’ Fontevecchia Verdicchio dei Castelli di Jesi Classico Superiore 2006 is pretty good, but the Grancasale Verdicchio dei Castelli di Jesi Classico Superiore 2005 is a notch above. Made from grapes harvested quite late in the year, the must is kept in contact with the skins at cold temperature for 18 hours under a blanket of CO2 in order to extract both texture and flavour. The result is a wine with plenty of ripe pineapple and pear fruit, more than a trace of toasted nuts, a streak of minerality and a somewhat oily texture. I also enjoyed this producer’s Cimao 2005, an IGT wine made from ultra-ripe Verdicchio grapes that teeter on the upper limit of the DOC regulations (hence it’s safer to declassify the wine into an IGT). Half the wine is aged in oak for up to 8 months, the rest is aged in stainless steel. Cimao is a complex wine with layers of marmalade, quince, pineapple, honey and nuts, somehow held in check by lively acidity and good minerality. The finish is hugely long – what a characterful wine. While I hate playing favourites, I should also mention Casal Farnetos Rosae 2007, a Lacrima di Morro d’Alba, which has a lovely, lifted perfumed nose of griotte cherries, rose petals, violets and spice. The supple tannins give just a hint of crunch and the zesty acidity helps sustain the lively finish. See all UK stockists of Casal Farneto on wine-searcher.com. I also enjoyed the wines made at this estate, whose home base in a funkily decorated former convent is the embodiment of its pleasant blend of modernity and tradition. Its Stefano Anonucci Verdicchio dei Castelli di Jesi Riserva 2004 provides a concentrated mouthful of pear, quince and pineapple fruit with a touch of spice, almond and honey. There’s some oak, but it’s subtle and well integrated into the creamy body of the wine. The same producer’s Pathos, an IGT blend of Merlot, Cabernet and Syrah is a big, powerful wine in the international style. It’s redeemed by the depth of its fruit, its juicy acidity and fine-grained tannins. Alternatively, those after something with a touch of terroir might prefer Il Maschio da Monte 2006, a Rosso Piceno with 95% Montepulciano and 5% Sangiovese. This rustic, rather meaty wine has firm tannins that keep the chocolate-tinged dark cherry and plum fruit caged in. Given time it should open out into a densely textured, potent wine. See all UK stockists of Azienda Santa Barbara on wine-searcher.com. Ironically enough, I didn’t taste the 1997 Verdicchio dei Castelli di Jesi Riserva Vigna dell Oche from San Lorenzo until after I returned from the Marche, but when I did I was deeply impressed by its depth, balance and elegance. It provided proof that these are wines with the capacity to age incredibly well. The same producer’s Vigna Paradiso Lacrima di Morro d’Alba is also worth looking out for, thanks to its perfumed vivacity. See all UK stockists of Fattoria San Lorenzo on wine-searcher.com. The Lacrima di Morro d’Alba del Pozzo Buono in 2007 is excellent, with a richly aromatic nose full of roses, violets, cherries and a bit of spice. There’s an extra note of smoky tea that comes through on the palate to add another layer of flavour; smooth, ripe tannins and lively acidity. The wine is so nicely balanced you don’t feel the 14% alcohol, even on the finish.